Located in Noord, this aparthotel is within a 10-minute drive of Old Windmill and Butterfly Farm. This aparthotel is 1.5 mi (2.5 km) from Eagle Beach and 1.7 mi (2.8 km) from Palm Beach. When you're vacationing at Eagle Aruba Resort & Casino, it's all about you – from friendly, personalized service that's tailored to your needs to every imaginable amenity you and your family require for an unforgettable vacation in Aruba. Eagle Aruba Resort & Casino is located about five minutes walking distance, from powder white Eagle Beach. TripAdvisor's 2018 Traveler's Choice awarded the Eagle Beach as the 3rd best beaches in the world. For he past 5 years Eagle Beach have been in the top 5 beaches of the world. We're short ten minutes' drive from the airport, 5 minutes from Oranjestad, Aruba's Capital, and less than 5 minutes from one of the Caribbean, most exclusive shopping areas, with numerous dining options, offering some of the best dining experiences in the Caribbean. Start with our 362 one-, two- or three-bedroom suites. 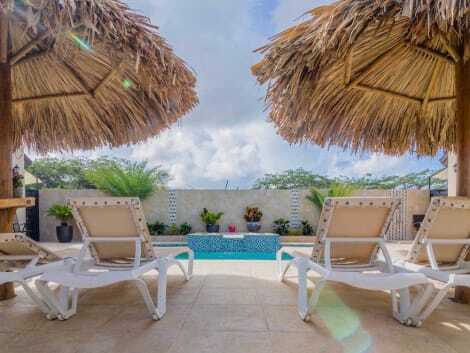 Each is a private haven of comfort and tranquility, with air conditioning, a complete kitchen, a spacious living room, and a private balcony or patio surrounding the oasis swimming pools. Step outside and take a refreshing dip while sipping your favorite beverages at the swim-up bar. Take the kiddies down the 150-foot water slide or enjoy the plunge by yourself (you know you want to!). Drop by the Bikini's Bar & Grill for tropical cocktails and live music or try your luck on the slots and table games at the Hotel Casino. Head down to the water and enjoy a day at the private beach, or take advantage of other recreational amenities including an outdoor pool and a spa tub. Additional amenities at this aparthotel include complimentary wireless Internet access, concierge services, and gift shops/newsstands.